Dr. Stephen Kinsella is our guest blogger, analysing the Quarter 3 2008 figures. Aggregate statistics like those presented in this report contain individual stories. One doing the rounds is the story of a man with five 100% mortgaged houses, three of which are now empty due to the downturn in construction and quickly bankrupting him month by month because he can't sell them. Stories like this will surely become more common as we move into 2009. Rental rates are falling by 3% on average across the country. Areas outside major cities are seeing 5% drops or more since the last daft rental report. The latest data show an average decrease of more than €20 in rents, combined with a sharp increase in the stock of available rental accommodation. Rental properties in the areas bordering major cities like Dublin's commuter belt have seen rents drop between 3% and 5%. The cities themselves fare little better, with Cork city seeing the worst decline of 5.3%, taking the average rent down to €993. It should be said that the amounts dropped are still small relative to the overall rents being charged. We are not seeing precipitous drops in the rental market...yet. 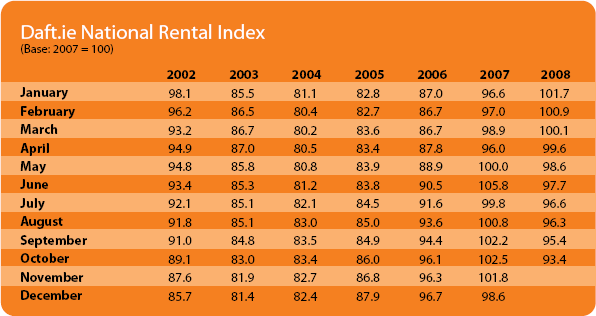 The average rent for the third quarter in 2008 in South County Dublin was €1,538. In this area, Landlords are asking for 4.8% less in rent than this time last year. The drop is costing South Dublin landlords €74 a month. A drop of €74 on €1,538? Hardly nail-biting decreases, but the trend is solid: rents are on the decline. Given the rapid falls in other areas of the property market to date, these slight sticker price discounts will not seem as dramatic, but they are indicators of a solid downward trend caused by flagging demand and chronic oversupply in certain areas. Thanks to the downturn in the construction, and related, industries, there is also a drop in the number of people wishing to live in certain locations. Given such an increase in the stock of available rental accommodation, we should expect further rental price decreases into the new year as the market adjusts downwards once again. Shakespeare once wrote that bad news infects the teller. At first gloss things do not look good for property owners in the rental property market, but recent developments in the international economy might offer some slight inoculation. The European Central Bank has decreased interest rates, which perforce will decrease mortgage repayments in Ireland assuming the banks pass on those decreases uniformly. The price of oil is falling as the world economy stabilizes coming into the new year. All mortgage owners will be relatively richer as a result, including the landlord classes. Inflation is dropping as consumer demand falls, making it easier to keep a rental property in good condition. Refurbishing or refitting a rental property to increase its likely rental rate can now be done at a steep discount, with labour and materials selling at much more competitive rates than 12 months ago. Attracting potential renters to competitively priced, well-maintained rental accommodation can now be done very cost effectively through services like daft.ie, as well as local advertising and word of mouth. In a market with too many rental properties, those wearing the buyer's hat are now firmly in control. The message to those already in rented accommodation is: if you are at all unhappy with your rental circumstances, push for improved conditions, bargain for lower rents, or move to a better place. New entrants to the rental market should likewise bargain hard for better rental rates, rental agreements, and living conditions. Everyone renting in Ireland will feel relief from the familiar pressure of ever-increasing rents. This decrease in rents will help their bank balances, and make them a little richer, and perhaps they will spend some of that extra money, and so help the economy out of the downturn. 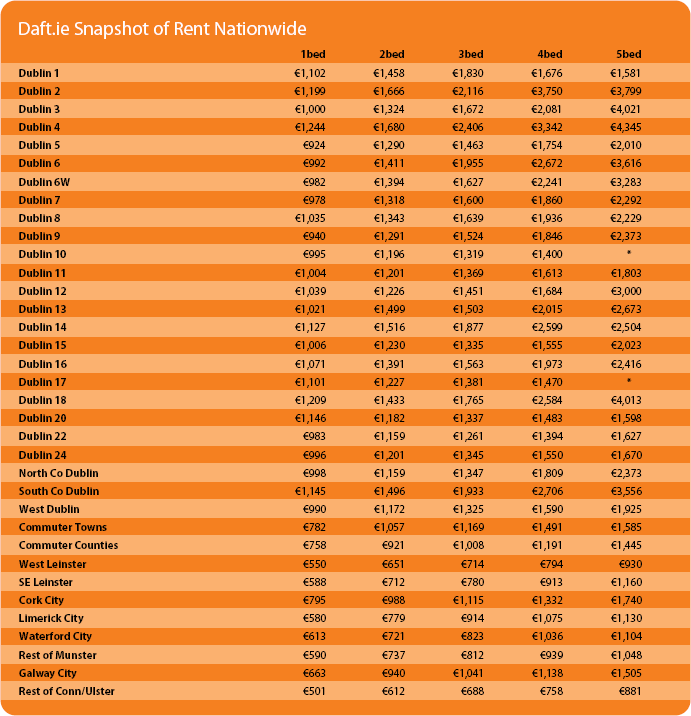 The rental price drops help those in some of the weakest positions in Irish society: those in need of short term accommodation in a high cost economy, migrants, and those on lower incomes. That is to be welcomed. Those with several rental properties with varying vacancy rates should look to securing emergency bridging funds for their declining investments, upgrading their properties, and squeezing property management companies to justify their fees. Many property owners are now faced with negative equity, a situation where the realised sale price of the property is less than the mortgage owed. If the property is held for investment purposes, and selling is no longer an option, there are only two short run responses to this situation: rent the house at a rate which just covers the mortgage; or pay all or part of the mortgage yourself, and wait out the downturn. 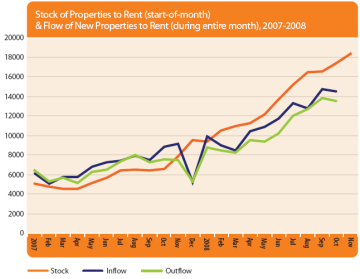 Property owners taking the first option have caused the glut in the rental market---up from 5,000 units for rent in January 2007 to over 18,000 in November 2008. Those taking second option know it is unsustainable, unless the property owner has a large amount of liquidity, something in short supply these days. And who knows how long the downturn will last? If our housing boom-and-bust cycle is comparable to our European neighbours, then we can expect it to take a minimum of 3-5 years for the market to recover. Holding investment vehicles like rental properties for that length of time is not sustainable by the majority of landlords, but with an oversupply of sale-able houses, individual landlords may have no choice but to rent out their property at a loss for some time to come, and make up the difference in their mortgages out of other income, or default on the loans altogether, creating a headache for the banks in the form of bad debts. I would expect to see more of each alternative in the next daft report.